This week's Sunday Scribblings prompt is Dream Journey. 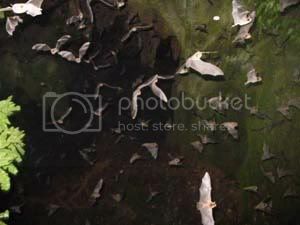 On Friday evening, three friends and I went to Tamana caves, filled with 500 thousand to 3 million bats . for short video of the bats flying out of the mouth of the cave. Just after sunset, hundreds of thousands of bats fly out, going at such a speed that they almost appear to be static on the screen (see above video). I had filmed them in the forested semi darkness using the video function on my digital camera, so it's not too clear, but gives a good idea. 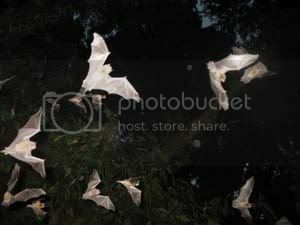 I have only seen 2 bats in person - they appeared one evening when my San Pedro Cactus had bloomed. I still think about putting up what they call a "bat home" to enjoy their presence again. i love " bat ballet" that really is what it looks like! you love flying creatures, don't you?